If you are an Amazon Prime member and have been thinking about trying one of the Fire TVs, Amazon may have a great deal for you. For two days only, Prime members can pick up the new Fire TV Stick for $19 – that’s $20 off the regular price of $39. The stick comes with a remote control, but it is not voice-activated like the Fire TV Box. Instead, there is a downloadable app for voice control that can be used with the device, or you can purchase a voice-activated remote control separately. You can play games with the included remote control and it also supports the use of the optional Fire game controller. There are some differences between the Fire TV Box and the stick. 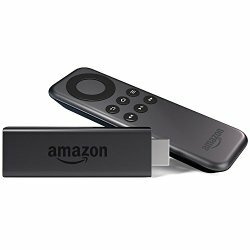 The Box has a Quad-core processor and 2 GB RAM The Fire stick is a Dual-core processor with 1 GB RAM. Both devices are wireless, but the Fire TV Box can also connect directly with an Ethernet cable. ETA: The Fire TV Stick is a pre-order and will be released on November 19th. How about you? Is the $19 price tag tempting to you? This entry was posted in Amazon Fire TV and tagged Chromecast, Prime, Roku, sale, streaming stick, TV. Bookmark the permalink.